Talk about slow on the uptake: I just got a joke I first heard maybe 40 years ago. And it was old when I first heard it. The line was first used in the 1945 short "Herr Meets Hare" (in which we also see foreshadowing of Chuck Jones' masterpiece, "What's Opera Doc.") Bugs' directional failure in New Mexico lands him in Nazi Germany, where he of course gets the best of Hitler and Goering. Reading that post fired a cereal-encrusted synapse from my pre-adolescent brain which connected with repeated viewings of Cars and the renumbering of the Highway To Hell, US Route 666 and a cartoon light bulb went off over my head. Always the same direction, always the same city. The Left Toin at Alba-koi-kee must have had a basis in real life. It was probably rooted in the glory days when Route 66 was the main drag from the Midwest to the West Coast -- the same era when Chuck Jones, Friz Freleng and Mel Blanc were working their genius. "Route 66 is clearly shown following the course of Central Avenue. After passing downtown, the road angles slightly to the right, paralleling the river. Just after the Albuquerque Country Club (depicted rather prominently), it makes a left turn to approach the crossing of the Rio Grande." 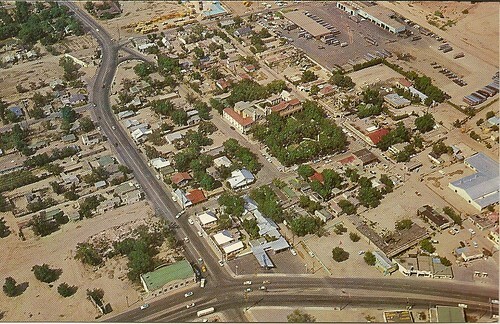 Central Avenue was US 66 and Rio Grande Boulevard was New Mexico 194. It's no longer the Mother Road; just like Radiator Springs it was bypassed by Interstate 40. But it's still a busy city corner. Westbound wabbits on 66 would have to take the left turn at Albuquerque to stay on course to California. A more instinctive right turn from the right lane would send you north on 194. Adding to the confusion was a major change in the route in 1937, not far from here. Before that year Route 66 entered Albuquerque from Santa Fe to the north along 4th Street, about a mile east of the Left Toin. After `37, Route 66 came into Albuquerque from the east. And here is the political connection: "According to legend the rerouting was done at the behest of Democratic Governor Arthur T. Hannett to punish the Republican Santa Fe Ring which had long dominated New Mexico out of Santa Fe." This junction must have been infamous among 1940s and 1950s era southern Californians. How many weary cross-country travelers, low on rationed wartime gas, came across that confusing Y shaped intersection, veered right onto Rio Grande, and wound up headed northeast toward Santa Fe? Were there any animators among them? Their love of inside jokes points to yes. And after that first time, it was a popular punch line, made all the funnier by Bugs' mispronunciation in his Brooklyn-Bronx voice. The Left Toin as seen in the 1960s. Doesn't look too confusing from the air, but probably more difficult at street level. Of course, since Bugs generally traveled by tunneling underground rather than surface routes, I may be wrong.